At a recent Brand Orientation Workshop at Keuka College, veteran staff members and current students learned about how a campus visit from Eleanor Roosevelt, back when the U.S. was on the brink of entering World War II, still inspires the Keuka College of today, especially its nursing students. Because they heard this story, they, along with colleagues from across campus, will be including it into their own outreach efforts on behalf of the College. At a presentation of the brand strategy at Gettysburg College, a senior student learned that her fellow students of 150 years prior, walked through the town square of Gettysburg, PA with President Abraham Lincoln, and then assembled to hear him deliver the dedication remarks – the Gettysburg Address – at the national cemetery. She took action to make that incredible story relevant to the students of today. Since 2003, every incoming class of Gettysburg College has participated in the First-Year Walk, recreating the 1863 walk to hear the Gettysburg Address. The 2013 First Walk, Gettysburg College. Samantha McGreevey, a history and elementary education major at Georgian Court University, entered Georgian Court thinking that she would be a strong classroom teacher. The brand promise of GCU states that “everyday, we promise to be unrelenting in our commitment to developing in each student the conviction that they, personally and collectively, have the capacity to change the world for the better. Inspired by her professors and others at GCU, Samantha will be pursuing a career as an educational policy advocate so that she can improve educational conditions for thousands of children every year. Student orientation leaders who heard Samantha’s story decided to revamp their orientation curriculum to stimulate students to consider the ways in which they can make a contribution to the world starting from Day One at The Court. Here at Cognitive Marketing, we’ve believed in the power of good storytelling for more than 20 years, and we have seen how brands are built by engaging all of their constituents in the storytelling process. In order to mobilize the campus community thusly, you must first motivate them. We have found that a series of three activities will inspire the storyteller in everyone connected to the college. 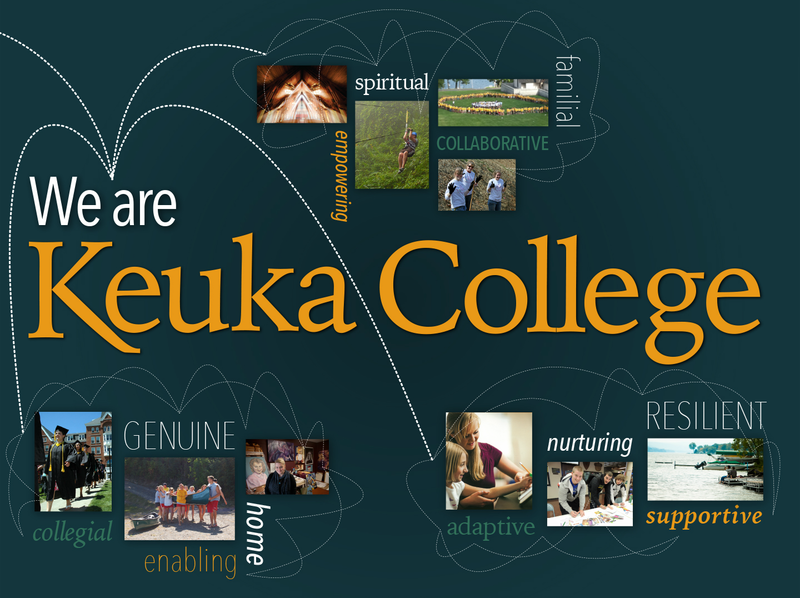 A screenshot from a recent brand orientation presentation given at Keuka College. Once your campus has formulated its brand identity, you must present it to the key stakeholders: faculty, staff, alumni and student leaders. Using a multimedia presentation, demonstrate how your brand story has been played out through the generations – from your first alumnus to your current students. Be sure the audience understands the fundamentals of your brand, including how to use the full set of brand tools. The positive effects of a “knock-your-socks-off” presentation like this cannot be overstated. When we put on brand orientation workshops at colleges and universities, we provide Brand Messaging Workbooks, which include all of the brand language tools (positioning statement, key messages, brand promise, and brand signature), along with proof-points that substantiate each of the tools. Armed with this framework, these storytellers are then encouraged to start telling stories, both those of their own making and those that are part of the institution’s story archive. Admissions tour guides reframed their personal anecdotes through the lens of the brand, authors of the academic departments respective web pages emphasized the key messages, and everyone across campus began to better recognize those “brand moments” when the promise is put into action. Building a brand is a collaborative endeavor. As your community begins to embrace your brand, it is key to maintain campus-wide ownership of the ongoing planning and implementation processes. Try hosting a learn-and-lunch series where faculty and staff come to know how they can support the institutional brand by including stories on their departmental blogs and twitter feeds, or when they engage with prospective students, donors and other friends of the college. Encourage the ongoing submission of stories, proof-points, photos, and videos from all constituents that demonstrate their personal reflections of the brand. A brand is a story never completely told. In the creation and sharing of the stories of a school, internal pride swells, connections to the hearts and the minds of alumni and future alumni are solidified, and the reputation of the institution grows ever more prominent.